Entity has a definite individual existence. 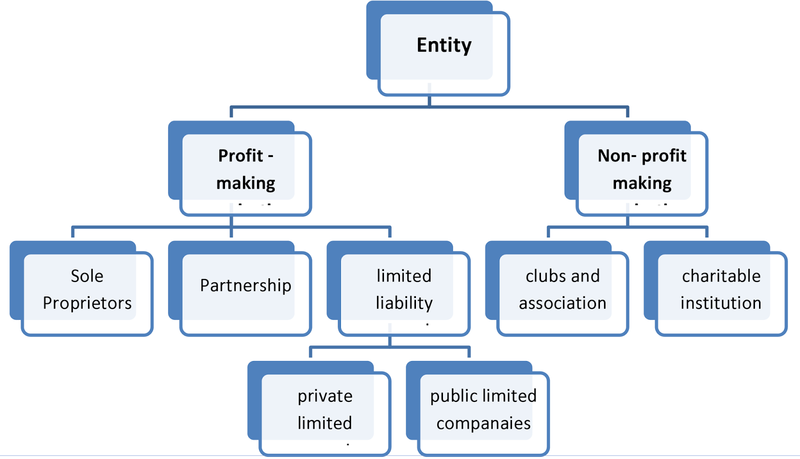 Business entity is an identifiable business enterprise such as Super Bazaar, Jewellers and so on. An accounting system is always devised for a specific business entity (also called accounting entity). Transaction is an event involving some value between two or more entities. It can be a purchase of goods, receipt of money, payment to a creditor, incurring expenses and so on. It can be either a cash transaction or a credit transaction. Assets are economic resources of an enterprise that can be expressed in monetary terms. They are items of value used by the business in its operations. For example, Super Bazar owns a fleet of trucks which it uses to deliver goods. The truck provide economic benefit to the enterprise. So the are shown on the asset side of the balance sheet of Super Bazaar. Fixed Assets are assets held on a long term basis such as land, buildings, machinery, plant, furniture and fixtures. These assets are used for the normal operations of the business of goods, receipt of money, payment to a creditor, incurring expenses and so on. It can either be a cash transaction or a credit trans-action. Current Assets are assets held on a short term basis such as debtors, bills receivables, stock, temporary marketable securities, cash and bank balances. Profit is the excess of revenues of a period over its related expenses during an accounting year. Profit increases the investment of the owners. Gain is a profit that arises from events or transactions which are incidental to business such as sale of fixed assets, winning a court case, appreciation in the value of an asset. The excess of expenses of a period over its related revenues is termed as Loss. It decreases the owner’s equity. It also refers to money or money’s worth lost (or cost incurred) without receiving any benefit in return. For example, cash or goods lost due to theft, fire and so on. It also includes loss on sale of fixed assets. Discount is the deduction in the price of goods n sale. It is offered in two ways. Offering a deduction of an agreed percentage on the list price at the time of the sale is one way of giving discount. Such a discount is called ‘Trade Discount’. It is generally offered by manufactures to wholesalers and by wholesalers to retailers. After selling the goods on credit basis, debtors may be given a certain deduction in the amount due if they pay the amount within the stipulated period or earlier. This deduction is given at the time of payment on the amount payable. Hence, it is called ‘Cash Discount’. Cash discount is an incentive that encourages debtors to make prompt payments. The documentary evidence in support of a transaction is known as Voucher. For example, when you buy goods for cash, you get a cash memo. When you buy goods on credit, you get an invoice, When you make a payment, you get a receipt, and so on. Goods refer to the products which a business unit produces and sells, or buys and sells. The items that are purchased for use in the business are not called good. For example, for a furniture dealer the purchase of chairs and tables is termed as goods, while for others it is furniture and is treated as an asset. Similarly, for a sta-tionery merchant, stationery is goods. But for others, stationery is an item of expense (not purchases). Withdrawal of money and/ or goods by the owner from the business for personal use is known as drawings. Drawings reduce the investment of the investment of the owners. Purchases Is the total amount of goods procured by a business on credit and cash, for use or sale, in a trading concern, merchandise is purchased for resale, with or without processing In a manufacturing concern, raw materials are purchased, processed further into finished goods and then sold. Purchases may either be cash or credit purchases. Stock (inventory) is a measure of something on hand – goods, spares and other items in a business. It is called ‘Stock in hand.’ In a trading concern, the amount of goods that lie unsold at the end of an accounting period is called closing stock (ending inventory). In a manufacturing company, closing stock comprise raw materials, semi-finished goods and finished goods on hand on the closing date. Similarly, opening stock (beginning inventory) is the amount of stock at the beginning of the accounting period. Creditors are persons and/ or other entities who have to be paid by an enterprise for providing goods and services on credit. The total amount in favour of such persons and/ or entities on the closing date is shown in the balance sheet as Sundry creditors on the liabilities side. This entry was posted in Accounting and tagged Assets, Basic Terms in Accounting, Creditors, Discount, Drawings, Entity, Gain, Goods, Loss, Profit, Purchases, Stock, Transaction, Voucher on July 16, 2018 by manish.